Many traditional carpet cleaning companies utilise an outdated cleaning system that involves using lots of hot water combined with chemical agents to clean your carpets and fabrics. However, there are a number of drawbacks with this method. Firstly, it can leave your carpets, curtains, sofas and rugs soaking wet long after the cleaner has left leaving you unable to use them for some hours. In addition, the chemicals they use can make the fibres sticky, so that within minutes of re-use they start to attract dirt again quicker than they would have done before the clean. The chemicals can also leave residue behind which cannot be removed by vacuuming. 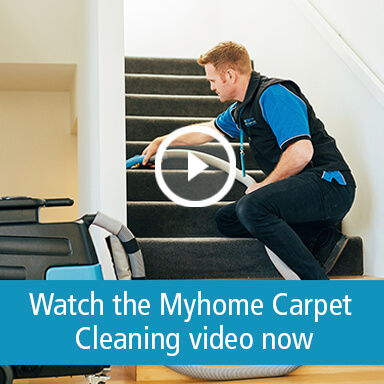 That’s why Myhome have developed our own unique Dry-touch System; a revolutionary 6 step process that ensures your carpets and fabrics are deep clean, reviving the soft look and feel of the fibres, without leaving them soaking wet, prone to shrinkage or smelling of chemicals. The Dry-Touch System we use relies on the power on encapsulation technology that allows us to deliver unparalleled levels of cleaning, without the chemical residues, without the harsh smells and without leaving your carpets soaking wet. Encapsulation works by using cleaning fluids that contain polymers as well as detergents. After the detergent has done it’s job in attracting the dirt and debris, the polymers encapsulate the detergent along with the dirt and debris. This encapsulated mixtures then dries almost completely, allowing both the dirt and detergent to be vacuumed away, without leaving wetness or residue behind. So, if you’d like to know more call us on now on 13 22 31 for a chat, or to request a free, no obligation quotation. Alternatively, you can send us your enquiry online and we’ll get back to you shortly. 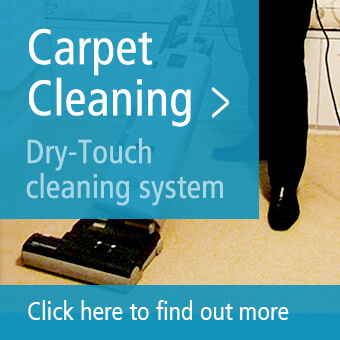 You may also like to discover the Dry-Touch 6 step process, find out more about our Carpet Cleaning Service, or find out about our guarantee.